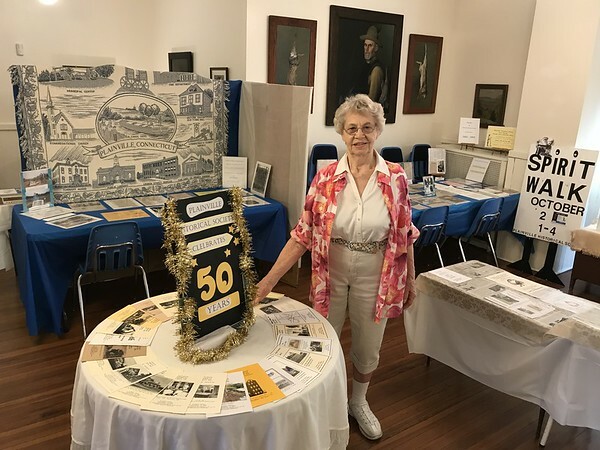 PLAINVILLE - Founded in 1968 by historian Ruth Hummel, the Plainville Historic Center is celebrating its 50th anniversary with exhibits dedicated to town history and those that helped to preserve it. The exhibit, on the second floor of the center at 29 East St., features numerous newspaper articles, photos and brochures. The exhibit is divided into time periods: 1969 to 1984, 1985 to 1995, and 1996 through present day. Gert LaCombe, interim president of the Plainville Historic Center, discussed some of the noteworthy events the Center participated in over the years Wednesday. Nelson was the first man to fly an airplane in Plainville in 1911. A model of his airplane hangs from the ceiling in the hallway leading to the event room. The Plainville Historic Center also used to hold regular antique shows and once organized a “Spirit Walk” at the East Street burial grounds where volunteers waited at gravesites and told the stories of those buried there to visitors. Other parts of the exhibit are dedicated to mile markers from 1835 which Hummel helped to find and restore and the Hartford circus fire of 1944, in which 11 town residents perished. There is also a section of the exhibit dedicated to African-American history in Plainville. LaCombe noted that the Norton House, which once stood next to Ideal Machinery, was a stop along the Underground Railroad. The original founders of what would become the Plainville Historic Center held their first meetings in the library, around then the town was preparing to celebrate its centennial. They later moved to the current building, which formerly housed town hall, the police department and the fire department, in 1973. “There used to be a third floor but it burned off and when the first world war came they didn’t have the money to put it back on, so they just topped it off,” said LaCombe. Today, the center features several rooms dedicated to town history. There are also walls with information about the town’s former railroad station and the textile mill that used to be at the center of town, as well as the famous town poet Anna Grannis, who worked there. The Plainville Historic Center’s bookstore includes books on the town’s centennial, books by Ruth Hummel about the Farmington Canal and others about the Civil War and the town’s former Methodist Campgrounds. Those interested in touring the Plainville Historic Center should call 860-747-6577. Posted in New Britain Herald, Plainville on Tuesday, 17 July 2018 19:36. Updated: Tuesday, 17 July 2018 19:39.